Written by Bryan Boomershine on August 25, 2017 . Posted in Blog. 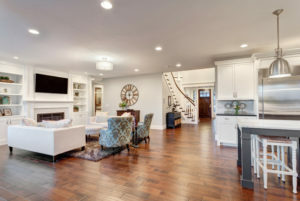 When it comes to interior design, many homeowners are under the impression that there are many traditional design elements or rules that must be followed. However, home decor is becoming more and more unique every day. There are no longer rigid rules that must be adhered to to achieve the look you want. Here are some common myths about interior home design trends. There is some truth to this, but it is far from being considered a hard and fast rule of interior design. In a 2017 interior design trends survey, more than a third of respondents said they would choose a neutral color palette if redecorating their home, but the size of a room isn’t solely dependent on color. Furniture and home decor are also major elements that must be taken into consideration. It’s perfectly acceptable to paint any size room any shade you want — it’s all about how you arrange furniture and make the most of the room’s other elements. This may make sense logistically, but there’s nothing wrong with putting any size furniture where you feel it would fit nicely. Freshhome.com says, “Small furniture in your small space will make your home feel more like a dollhouse than a home. Instead of filling the room with several pieces of small furniture, one or two larger pieces will make the room appear bigger. Where space is limited, think in terms of style and function.” This is important to remember if you want to maximize the creative elements in your home. It’s not entirely clear where this myth originated – perhaps from somebody with a little bit of OCD. The fact is, there’s nothing wrong with mixing even the boldest patterns and colors. Your home should reflect your personality and no one else’s. Don’t be afraid to let your creative side shine. This doesn’t just apply to furniture and wall color, either. You should feel free to include as many unique accessories with colorful prints and patterns as you wish. Ultimately, these are just a few common myths about interior design. For more information about home decor trends, contact Robert Bryan Home.